Anyone that’s utilizing custom emblems and paint jobs in Black Ops 3 should certainly not take it for granted. 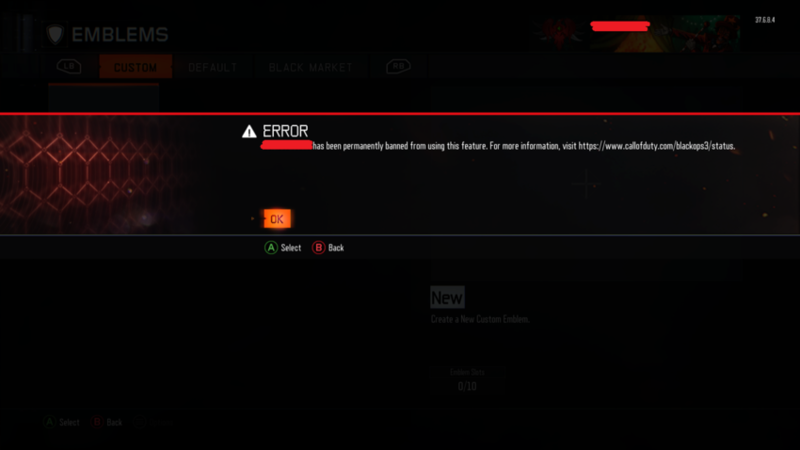 It seems that Treyarch Studios has started cracking down on any individual person that is taking advantage of this feature to transmit some kind of offensive material or designs. Using this kind of emblem will not lead to a ban from the game altogether, but will now result in a permanent ban from being able to use the custom emblem and paint feature in the future. Treyarch has done this before in games such as Black Ops 1 and 2, banning players that have misused this customization ability. Unlike games such as Battlefield 4 where if someone’s emblem is not related to a popular character, then it is more often than not some form of trolling, or an offensive gesture or animation. Some examples of the offensive content Treyarch is banning players for are any symbol that relates to a terrorist organization, animations of obscene material, and any design that is linked to nazis. So for those of you who do not want to see the error message below and would like to continue using this feature, I would suggest to avoid editing-in any sort of content that may be considered offensive in some way. What do you think about this ban being implemented into Call of Duty: Black Ops 3? Have you or someone you know received the above error message? Share your thoughts in the comments below!